National Hunt Horses To Follow 2017-2018 Season! 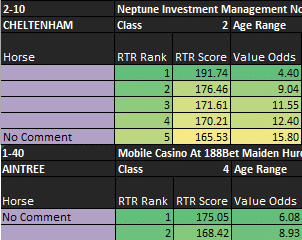 A fantastic Cheltenham Festival with some really impressive winners and a great week for RatingTheRaces TOP TIPS which made a handsome 37.90 points. A fast pace was set by Champagne Fever just like he did when winning the Champion Bumper last season and again this proved to be perfect. Coming off the bridle just after the 2nd last Ruby Walsh kept pushing along and Champagne Fever kept finding for him. He held off My Tent Or Yours and Jezki up the hill and looks a smart horse. With Cheltenham just around the corner many of these that ran at Newbury at the weekend are likely to bypass the Cheltenham Festival and wait till Aintree. Over at Doncaster our former TOP TIP AaimTo Prosper stepped up in distance as we had hoped and duly won a handicap hurdle in great style just beating the well handicapped and gambled Cockney Trucker. RatingTheRaces TOP TIPS made a profit of 6.05 points with an ROI of 27.50% This now takes our record to +124.40 in just 16 tipping days with an ROI of 42.03%.